Astronomers Observe Planets by Detecting Molecules Not Present in Planets’ Star « Adafruit Industries – Makers, hackers, artists, designers and engineers! Jens Hoeijmakers from UNIGE (ERC FOUR ACES and PlanetS team member), wondered if it would be possible to trace the molecular composition of the planets. “By focusing on molecules present only on the studied exoplanet that are absent from its host star, our technique would effectively”erase” the star,leaving only the exoplanet,” he explains.To test this new technique, Jens Hoeijmakers and an international team of astronomers used archival images taken by the SINFONI instrument of the star beta pictoris, which is known to be orbited by a giant planet, beta pictoris b. Each pixel in these images contains the spectrum of light received by that pixel. The astronomers then compared the spectrum contained in the pixel with a spectrum corresponding to a given molecule, for example water vapour, to see if there is a correlation. If there is a correlation, it means that the molecule is present in the atmosphere of the planet. 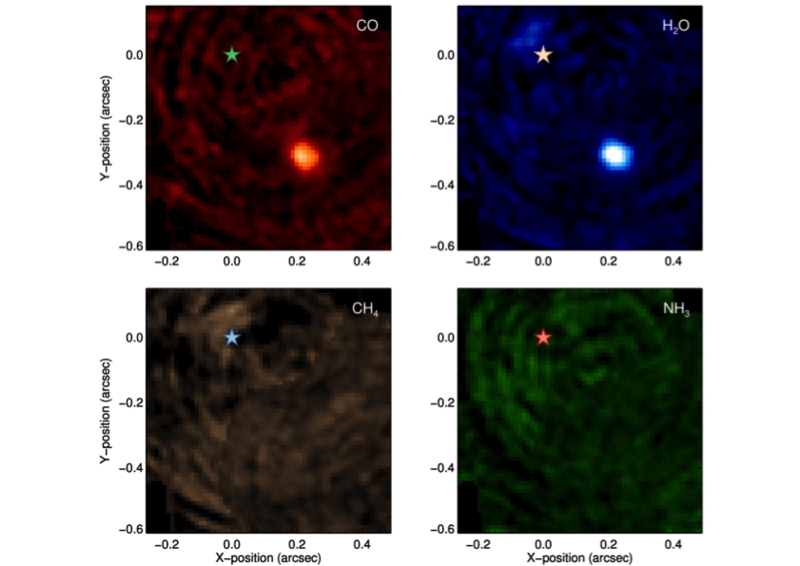 The host star beta pictoris remains invisible in all four situations. Indeed, this star is extremely hot and at this high temperature, these four molecules are destroyed. “This is why this technique allows us not only to detect elements on the surface of the planet, but also to sense the temperature which reigns there” explains the astronomer of the UniGe. The fact that astronomers cannot find beta pictoris b using the spectra of methane and ammonia is therefore consistent with a temperature estimated at 1700 degrees for this planet, which is too high for these molecules to exist.